A kiln studio standard. As a shelf separator, it helps prevent bubbles between the shelf and the glass. As a perimeter dam, it insulates against thermal shock and improves annealing. Cut and construct with it for bas relief design. 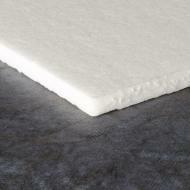 We use and handle only quality Lytherm paper because we like its tighter weave and durability. 1/4 in thick x 24 in wide x 12 in long (6.4 mm, 30.5 x 61cm). Sold by the each. Note: Longer continuous lengths are available by special order. Please contact sales@bullseyeglass.com to inquire.